The Contax G camera line consists of two cameras, the G1 and G2, interchangeable-lens cameras sold by Kyocera under the Contax brand in competition with the Leica M7, Cosina Voigtländer Bessa-R, and Konica Hexar RF. The G1 was introduced in 1994 with the G2 joining it in 1996. 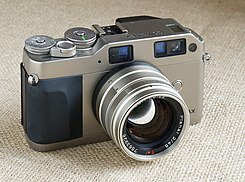 In 2005, Kyocera sold its camera business to Cosina and announced it would cease all activity related to the manufacture of Contax cameras at the end of the year, effectively spelling the end of the G system. The two G-series cameras have titanium-clad bodies and use the Contax G-mount, an electronic autofocus mount. When tested in 1995, the Contax G1 cost US$2,210 (equivalent to $3,600 in 2018) with the 45 mm Planar lens; the 28 mm Biogon and 90 mm Sonnar lenses were each US$660 (equivalent to $1,090 in 2018), and the list price for the 16 mm Hologon was US$3,000 (equivalent to $4,900 in 2018). The 45 mm Planar was listed separately at US$420 (equivalent to $690 in 2018). The Contax G2 listed for US$2,250 (equivalent to $3,400 in 2018) with the 45 mm Planar lens in 1999. Critics were quick to accuse the G1 of not being a "true" (mechanical) rangefinder, since it used autofocus and electronically linked mechanisms. However, the AF mechanism in the G-series does indeed use a twin-window system much like that of the older mechanical rangefinders — only in electronic form. The viewfinder covers the field of view for lenses of focal lengths between 28 and 90 mm through an optical zoom, and automatically compensates for parallax error and field when focusing closer. The in-body finder shows 90% of the captured frame at 0.59× magnification when the "normal" 45 mm lens is used. The viewfinder uses molded aspherical lens elements to reduce size. While there is an electronic connection between camera and lens to transmit data, the lenses have no AF motor and no means to adjust focus on the lens itself; both autofocus and manual focus are driven by a motor in the camera through a mechanical "screwdriver" coupling. The focus dial on the G1 is the dial marked with distances on the far right side of the body, and is also used to select the autofocus mode; on the G2, the focus dial was separated from the focus mode control and moved to the top front edge of the body. Compared with the original G1, the G2 has improved autofocus performance and higher top shutter speeds of ​1⁄4000 sec in manual mode and ​1⁄6000 sec in aperture priority mode. The manual focus wheel was moved from the top deck to the front, to about the same position as where the focusing wheel was located on classic Dresden and Stuttgart Contax rangefinders. In addition, the G2 was made available in a black finish along with black versions of the TLA200 flash and 28 mm, 45 mm, and 90 mm lenses. A new active auto-focus system has been added to the G2, which uses near-infrared beams to set the range. The G2 auto-focus also has two focusing modes: continuous, which constantly adjusts focus as the camera is moved; and single, which is a safety mode, focussing as the focus button is pressed (or shutter release half-pressed), and maintaining this reading until the shutter is released. If the camera fails to find focus in this mode, the shutter cannot be released. The lenses designed by Carl Zeiss for the G-series quickly established it as a camera of worth: the original trio of lenses released with the G1 included the 45 mm f/2 Planar, 28 mm f/2.8 Biogon, and 90 mm f/2.8 Sonnar; the 16 mm f/8 Hologon was announced at the system launch but was not immediately available. The G2 was released in 1996 alongside the 21 mm f/2.8 Biogon and 35 mm f/2 Planar. The 35–70 mm f/3.5–5.6 Vario-Sonnar, the first zoom lens for a rangefinder camera, was the last lens to be released, in 2000. All lenses were autofocus with the exception of the Hologon 8/16mm. The flange distance between the front surface of the lens mount and the film plane is only 29 millimetres (1.1 in), and Contax released the GA-1 adaptor which allowed the use of Contax/Yashica mount lenses. Unlike most bayonet-mount lenses, the Contax G mount uses a breech-lock mechanism similar to the manual-focus Canon FD and FL mount. The very high optical quality of the G-series lenses makes them excellent candidates for use with high-resolution digital sensors. Adapters are available for the Sony E-mount and Micro Four Thirds digital camera. Early versions of the G1 could only accept the four original lenses (16 mm, 28 mm, 45 mm, and 90 mm). A modified ROM was required to use autofocus with the 21 mm and 35 mm lenses; modified G1 cameras are marked with a green sticker inside the film door, and are known as "green label" G1s to distinguish them from unmodified "silver label" G1s. No G1 could accept the 35–70 mm, as it was a seven contact electrical connection and the G1 only features five contacts. Because the viewfinder was limited to the angle of view corresponding to the 28 mm Biogon, the 16 mm Hologon and 21 mm Biogon lenses were each bundled with a separate accessory viewfinder that mounted in the hotshoe. ^ Length, measured as projection from mount. ^ a b Requires external viewfinder. ^ Supplied with radially-graduated neutral density filter to ensure even exposure across the frame. ^ Zeiss states the focal length of this lens is 16.5 mm. ^ Zeiss states the focal length of this lens is 21.5 mm. ^ Zeiss states the focal length of this lens is 28.5 mm. ^ Zeiss states the focal length of this lens is 35.1 mm. ^ Zeiss states the focal length of this lens is 46.9 mm. ^ Zeiss states the focal length range is between 36.5 mm and 68.2 mm. Contax marketed a line of accessories dedicated for the G series of cameras and lenses. GD-1 - For the G1. Limited to date and time imprinting in frame. GD-2 - For the G2. Information (date, time, exposure) imprinted between frames, or collected and printed on first two frames. Exposure information includes compensation, shutter speed, approximate aperture, and exposure mode. Also provides intervalometer functions. GC-11 - For the G1. GC-112 - Front/top portion of G1 case with 2.8/90 Sonnar. GC-21 - For the G2. GC-22 - For the G2 with GD-2 data back. GC-210 - Front/top portion of G2 case with 2/45 Planar or shorter. GC-212 - Front/top portion of G2 case with 2.8/90 Sonnar. Available in both 46mm and 55mm sizes. TLA 140 - Introduced with G1. TLA 200 - Introduced with G2. Zoom reflector marked at 28mm, 35mm, 45mm, and 90mm coverage settings. GA-1 - Allows the use of certain Contax/Yashica mount lenses (focal length of adapted lens is selectable on adapter: 28, 35, 50, 60, or 85mm). Rangefinder on body used to determine distance, then lens is focused manually. 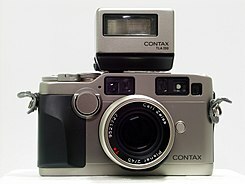 ^ "CONTAX-Branded Camera Business" (Press release). Kyocera Global. April 12, 2005. Archived from the original on 13 April 2005. ^ a b c d e f "Test: Contax G1". Popular Photography. April 1995. pp. 62–68, 73, 158. Retrieved 15 November 2018. ^ "Test: Carl Zeiss T* Lenses". Popular Photography. April 1995. pp. 69, 170. Retrieved 15 November 2018. ^ a b c "Contax G2". Popular Photography. December 1999. p. 135. Retrieved 15 November 2018. ^ a b c d e "First Look: New Contax G1". Popular Photography. November 1994. pp. 26, 30, 186. Retrieved 15 November 2018. ^ a b "Contax G2: More Is More!". Popular Photography. October 1996. p. 42. Retrieved 15 November 2018. ^ "Contax G2 Black". Contax Cameras. 1997. Archived from the original on 6 December 1998. ^ "Contax G2 (brochure)" (PDF). Kyocera Imaging. 1998. Archived from the original (PDF) on 8 June 2004. ^ Story, Derrick (June 22, 2017). "Learning More About the Contax G1 35mm Camera". the Analog story. Retrieved 16 November 2018. ^ "Hologon T* 8/16 datasheet" (PDF). Carl Zeiss. Retrieved 15 November 2018. ^ "Biogon T* 2.8/21 datasheet" (PDF). Carl Zeiss. Retrieved 15 November 2018. ^ "Biogon T* 2.8/28 datasheet" (PDF). Carl Zeiss. Retrieved 15 November 2018. ^ "Planar T* 2/35 datasheet" (PDF). Carl Zeiss. Retrieved 15 November 2018. ^ "Planar T* 2/45 datasheet" (PDF). Carl Zeiss. Retrieved 15 November 2018. ^ "Sonnar T* 2.8/90 datasheet" (PDF). Carl Zeiss. Retrieved 15 November 2018. ^ "Vario-Sonnar T* 3.5-5.6/35-70 datasheet" (PDF). Carl Zeiss. Retrieved 15 November 2018. ^ "Contax G Accessories". Kyocera Imaging. 1999. Archived from the original on 15 February 2001. Wikimedia Commons has media related to Contax G.
"Contax G2 (brochure)" (PDF). Kyocera Imaging. 1998. Archived from the original (PDF) on 8 June 2004. This page was last edited on 17 November 2018, at 23:16 (UTC).